This design was certainly a trial. I started the month with the illusion that I’d be following the #GlamNailsChallenge prompts. Nope! Okay…I thought I could combine the first two prompts of Snowman and Mittens and then follow the rest normally. 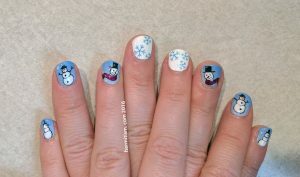 I had two snowmen stamping images wearing mittens. Nope! 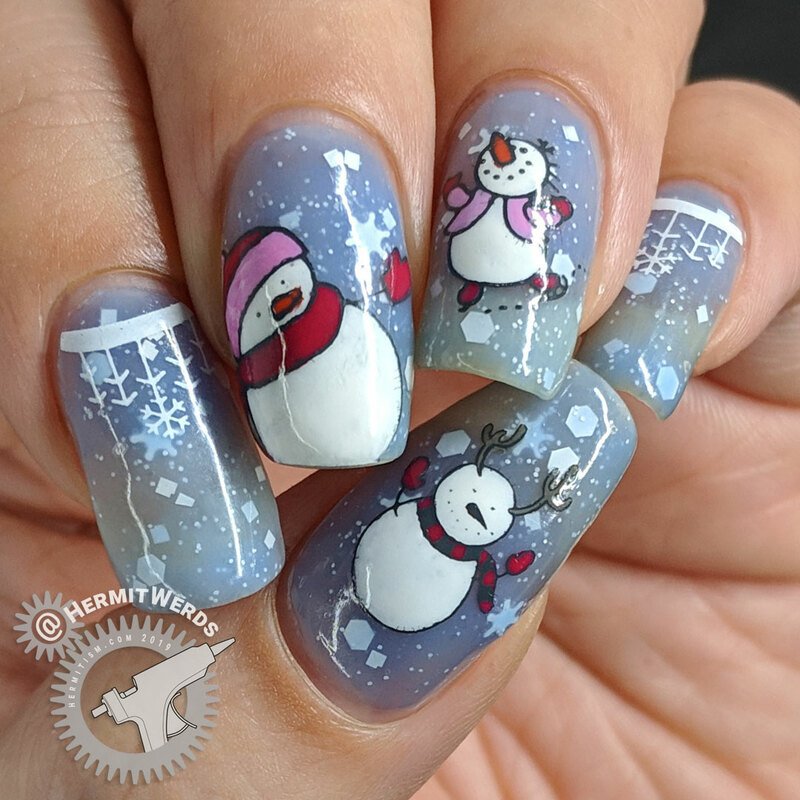 My heart wanted three snowmen. 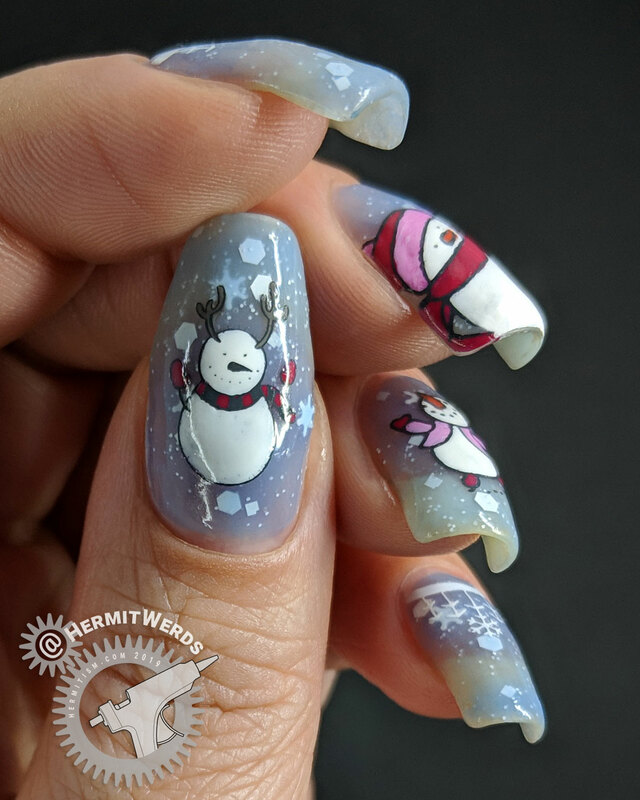 Okay, but we don’t have more…My brain drew up the design with two snowmen, painted on a crelly base polish, and pointed at the deadline. My heart initiated emergency procrastination procedures. Nope! We’re drawing now. Draaaw. 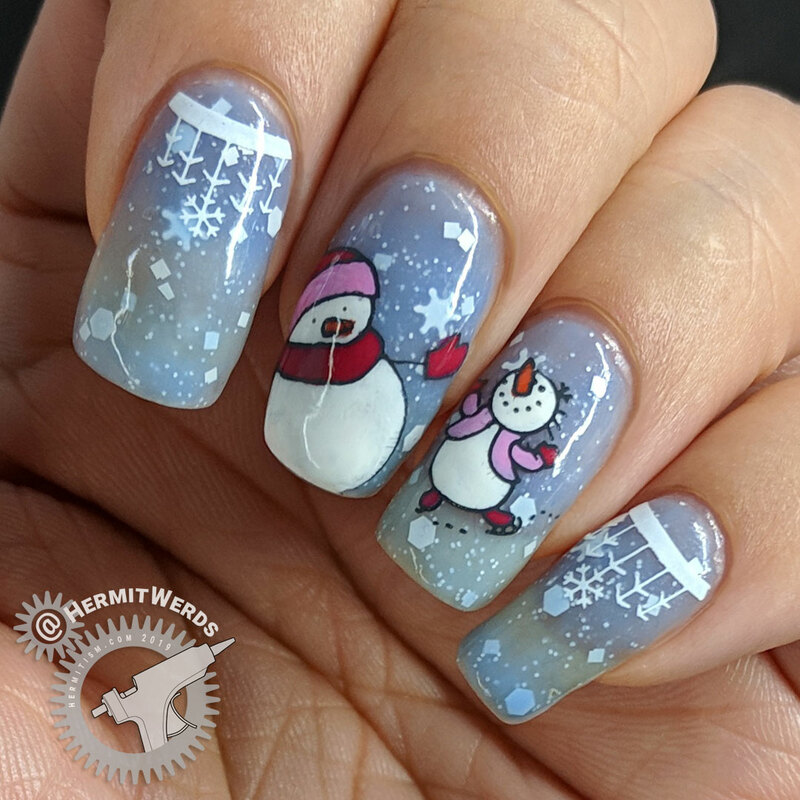 Okay… My brain surrendered and found another snowman and a mitten stamp that would fit over his little branch-y hand. Painting happened. I feel like celebrating. I finally used up Sinful Colors’ “Whiteboard“. 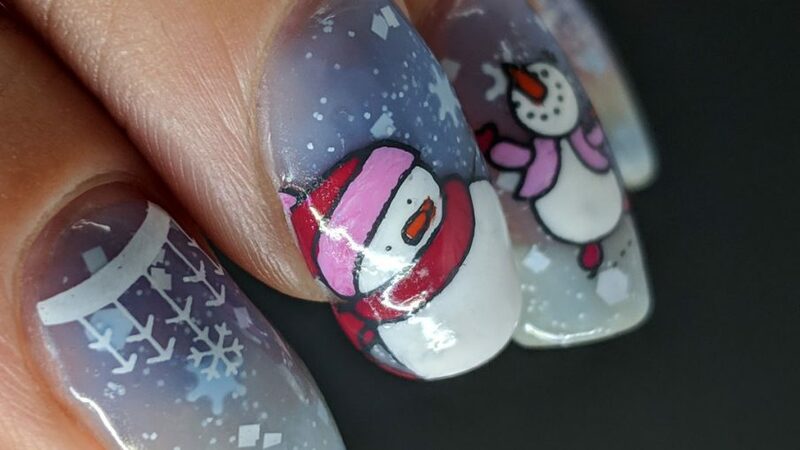 My policy is that if it’s ruining your nail art to keep using something, chuck it if you can’t reasonably fix it. What’s left in the bottle isn’t worth saving. So good-bye to a terrible matte white polish formula. I’m glad I found a use for you. 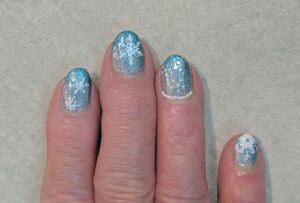 Shinespark Polish’s “Flake On!“ was not the most opaque polish as you can see below. Its shift from warm to cold is fairly subtle. 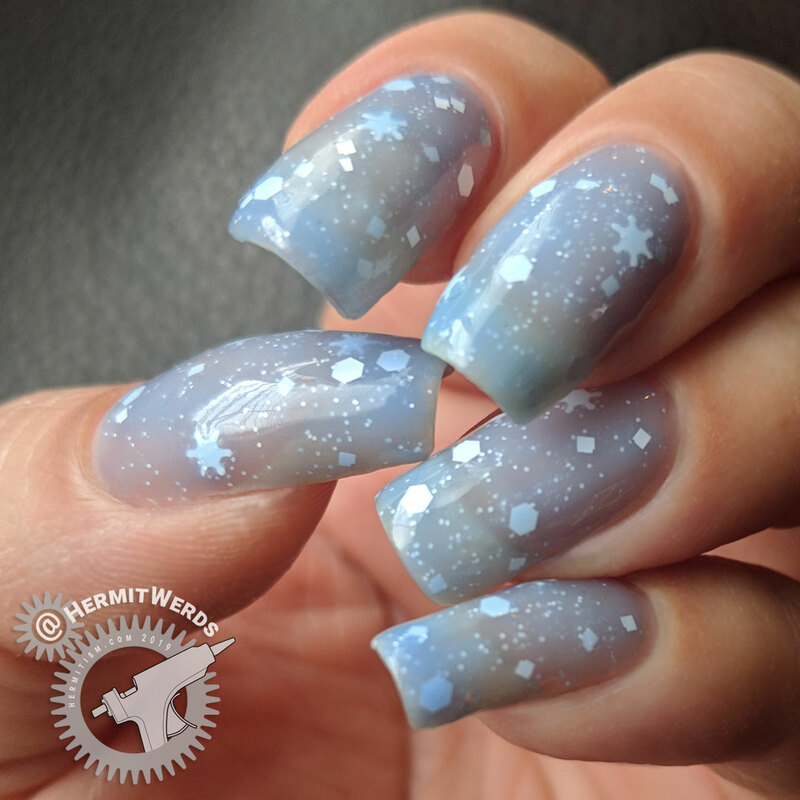 It’s still enough to enjoy throughout the day, but it would have been harder to capture so I’m glad I don’t have to take serious swatch photos (this is not a polish you can get anymore). Still, the little snowflake glitters are super cute and it amused me that the color would turn rather purple-y when my hands were really cold. Also, it didn’t chip! I had this on for nearly a week, through a major cleaning effort, and with a peel off base coat. I was the one that finally took it off. Amazing. 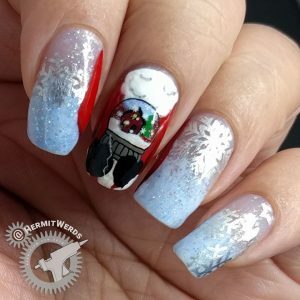 Yeah, so apparently I like combining light blue with snowflakes and then possibly red accents. I do like to combine blue and red because they make each other pop (esp this design), but I hadn’t quite realized I was this bad until today. 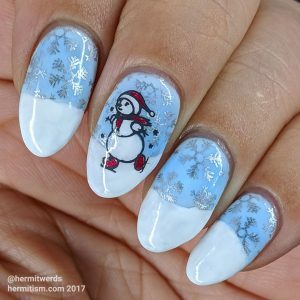 I looked at my photos and thought, “this feels all too familiar…” So I started looking at my posts during the winter and you see my seasonal design habit before you.